Villa Peacock is a beautiful, rustic holiday home in the historical city of Galle, Sri Lanka, minutes away from the popular Galle Fort, a UNESCO World Heritage Site as well as Unawatuna beach. 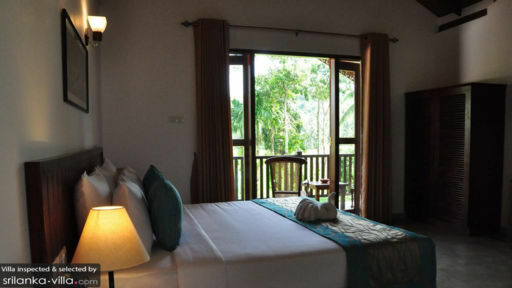 The villa features four bedrooms offering either a balcony or a garden view for refreshing mornings and evenings. The villa is a two-storey and also hosts its own in-villa restaurant that overlooks the expansive paddy fields stretching far out in front of the villa. Luscious green gardens accentuate the natural ambiance, and a nearby water body provides a tranquil and serene environment where you can relax and feel yourself get rejuvenated! 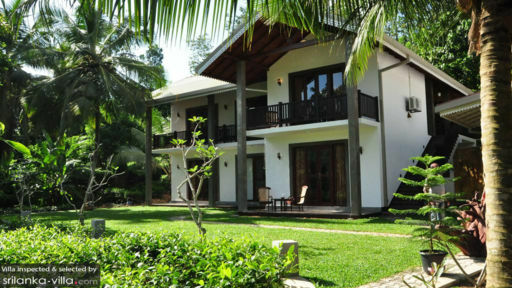 Villa Peacock houses four bedrooms each with its private balcony offering garden views to guests. You get to wake up to the sounds of nature after which a morning walk amidst the lawns is a given. The bedrooms feature a mix of double beds or twin single beds that can be arranged upon request. There is space for an approximate eight guests at the villa, so in case you are travelling with family or friends, this would be an ideal spot! Each of the bedrooms has its own private en-suite bathroom thus, making it convenient for guests to enjoy their time here. There are seating areas in each bedroom to make for additional space for relaxation with other guests. The villa building stands in the midst sprawling gardens that not only provide ample fresh, clean, and breathable air to guests, it also allows you to take a stroll along the rice fields that adjoin the gardens. The charming space gives you a chance to appreciate the understated and selfless beauty of nature’s bounty. You can relax on chairs placed out on the porch, where a cup of tea in the morning or evening is the perfect companion to some old-fashioned nature-gazing! The villa is often visited by majestic peacocks who might fan their feathers for you if you’re lucky. Designed with a Sri Lankan flair using natural materials and decorated with glowing lanterns, the villa sports open-concept relaxation areas. There are old-style, vintage chairs placed out on the porch for guests to take in the scenery. The comfortable and homely ambiance provides a lived-in experience to guests so they can feel right at ease in their home away from home. The gardens serve as a pleasing view for guests as they are waking from their night’s slumber while the morning dew gathers on the blades of the green grass. Villa Peacock offers its own restaurant that holds a few four-seater tables in an outdoor setting with the garden as the backdrop. While you enjoy the fresh breeze on your face, you have the luxury of being served delicious, piping hot Sri Lankan, Asian, or western dishes to tickle your taste buds! Start your day with a scrumptious breakfast prepared especially for you. The villa staff offers their generous and kind services to guests so that you have a memorable stay with them. 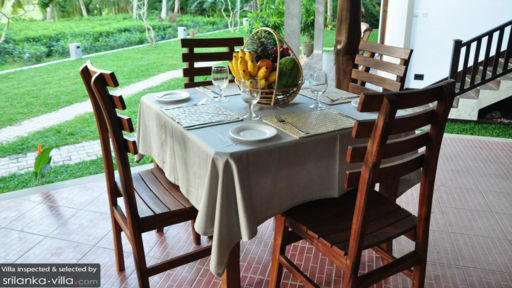 Serving a delightful breakfast in the morning, the staff takes care of your meals at the villa’s fine-dine restaurant. There is WiFi in all the bedrooms, free parking is available to guests and if you want they can even arrange for excursions around Galle or nearby areas! Ideally situated close to the major attractions in city of Galle which is teeming with historical Dutch architecture, the villa provides you a chance to explore town with ease. The Galle Fort is a must-visit destination along with the Dutch Church in the city. Unawatuna beach is not far from the villa and there are several museums that would look great on your to-do list! Amazing experience in Villa Peacock, best comfort of staff in a country like Sri Lanka. Jungle vibes. The facilities were great and the villa was clean.